Five S-400 Triumf missile shield systems deal sign between Russia and India. The official announcement of the deal for five Russian S-400 Triumf missile shield systems has been signed by India has been made. The S-400 Missile is one of the world's most advanced long-range air defence systems. China was the first nation to buy the S-400 missile system in 2014. Russian President Vladimir Putin meets PM Narendra Modi at Hyderabad House. He is in India on two-day visit to India. Deal for space cooperation signed between Russia and India . An Indian monitoring station will be built near the Russian city of Novosibirsk in Siberia, reported ANI. Vladimir Putin arrived in India on Thursday and was greeted by Minister of External Affairs Sushma Swaraj at the airport and welcomed by PM Modi at his residence. 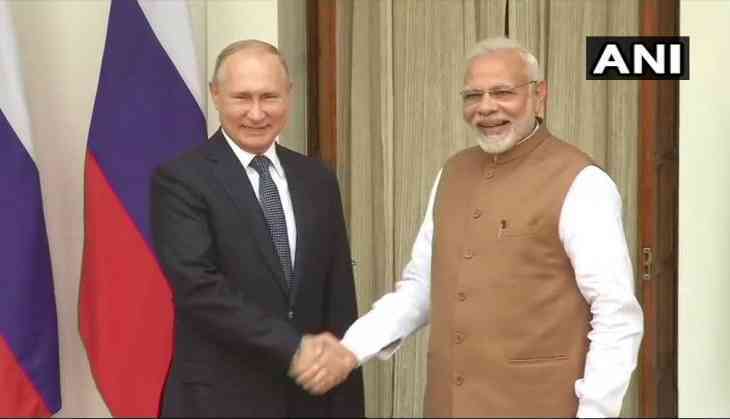 Putin has reportedly inked a $5 billion deal for India to procure Moscow's most advanced air defence system, the S-400 Triumf, risking US sanctions.